Training and Oscars just seem to go hand in hand. I do not know too many Oscar Fish owners that do not have at least one story of how intelligent their fish are. Oscars are easy to teach to play ball with a Ping Pong ball. They can learn pretty quickly to ring a bell. 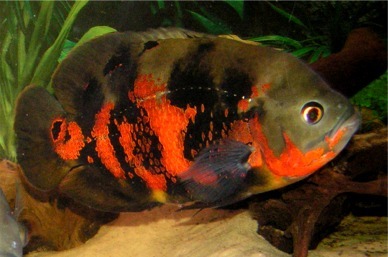 The only problem for the average person with Oscar Fish is that they need a big tank and lots of cleaning, they are a "dirtier" fish, and they grow very quickly and can become quite large. This is part of the fun for the fish enthusiast, but for the average pet owner, not so much. That said, their size can sure make training fun. You can use bigger training treats, read pieces of worms or such, finding props and equipment for the bigger fish is far easier then for the smaller, Betta or Guppy or even Goldfish, sized props. The contents of this page for Oscar Fish is still under construction. Please check back later!